History tells us that the famous cheese from the Po Valley was created in 1135 at the Chiaravalle Abbey, a few kilometers south of Milan. It was made so as to preserve the surplus milk produced each day, using special cauldrons, within monasteries, which can as such be considered the first dairies. The monks called it caseus vetus, or 'old cheese'. The people, who had no familiarity with Latin, gave it another name, derived from the cheese's compact, but granular appearance. They called it 'formaggio di grana', meaning 'grainy cheese'; or, simply, 'grana'. The most well known of the cheeses were the lodesano, or Lodi, considered by many to be the oldest, the Milanese (from Milan), the Parmigiano (Parma), the Piacentino (Piacenza), and the Mantovano (Mantua). The turning point in production of this family of cheeses happened in 1951. In Stresa, in June of that year, dairy owners and experts signed up to a European dairy "Convention," which laid down precise rules regarding the naming of these cheeses, with guidance on their characteristics. This occasion saw "Grana Lodigiano," which later became today's "Grana Padano," and "Parmigiano-Reggiano" cheese formally recognised. It was not, however, until April 10, 1954, that Italy established some rules on the "Protection of Designations of origins of cheeses". On October 30, 1955 the Decree of the President of the Italian Republic, no. 1269: "Recognition of designations covering production methods, product characteristics and production areas of cheeses", including Grana Padano, was issued. In 1996, GRANA PADANO obtained Protected Designation of Origin recognition by the European Union. Following the changes brought about by this recognition, the control functions - which consist of verifying whether the conditions laid down in the Production Regulations that give the product the right to use the diamond-shaped Protected Designation of Origin Grana Padano logo - are now being applied by CSQA S.r.l., based in Thiene (VI), who have been appointed by the Consortium and approved by the Italian Ministry of Agriculture. On 18 June 1954, on the initiative of Federlatte (the Federation of Cooperative Dairies) and Assolatte (Association of Dairy Industries), the Consortium for the Protection of Grana Padano cheese was created in order to bring together all the producers, affineurs and traders of this cheese. In October 30, 1955 the Decree of the President of the Italian Republic, no.1269: "Recognition of designations regarding production methods, product characteristics and production areas of cheeses”, including Grana Padano, was issued. It was not until the Ministerial Decrees of 1957 that the Consortium for the Protection of Grana Padano took on the role of overseeing production and marketing of the cheese. The Consortium for the Protection of Grana Padano cheese (CTFGP) comprises 129 dairy producers, and 153 affineurs. The Consortium has also authorised 130 companies to package Grana Padano cheese in portions, while 30 have permission to sell it in grated form. 19 companies are authorised to use the PDO for processed products. The Consortium’s headquarters is in San Martino della Battaglia, a town in the Desenzano del Garda area, in the province of Brescia. It is therefore in the very heart of the Grana Padano production, which extends along the Po Valley and includes 32 provinces, from Piedmont to Veneto, from Trento to Piacenza; today, production is concentrated in 13 provinces. - is a non-profit organisation. performs actions, including legal actions, to defend the denomination, the distinctive marks and the sole rights of the Consortium in general, and to prevent or penalise infringements and/or acts of Consortium members and/or third parties who violate the interests of the Consortium and/or its members. Grana Padano is made exclusively from raw Italian milk from the production area, which is partially skimmed by natural surface skimming. The milk is produced by cows milked only twice daily and fed according to specific rules. The milk is processed in cone-shaped copper-lined cauldrons large enough to produce two wheels of cheese (called “twin wheels”). Once the milk has curdled after a natural whey starter and calf rennet have been added and heated to 31- 35°C, the curd is chopped with a giant whisk (“Spino”). It is then heated and stirred continuously to a temperature of 53-56°C and left in the vat to rest for up to 70 minutes until it grows firm. Using a sort of wooden shovel(“pala”) and a linen cloth (schiavino), the cheese makers raise it within the cauldron and divide it into two equal parts, known as “twin wheels”, each of which is wrapped in a linen or jute cloth and extracted from the cauldron and placed on long tables. At this point each new wheel is enclosed in a cylindrical mould known as a "fascera", once made of wood and today of a suitable plastic material. This is tightly sealed and pressed by a heavy disk of the same material. After about 12 hours of "shaping", another plastic band is placed between the mould and the side of the wheel: the mould marking stamp, embossed with the marks of origin: the four-leaf clover stamped with the serial number of the dairy, the abbreviation for the province and the month and year of production, and small diamond-shaped lozenges that show, dotted inside them, alternately the words "GRANA" and "PADANO". After about 24 hours, the mould is replaced with a steel one, studded with small holes and slightly rounded, which, in about a day, gives the cheese its characteristic shape of convex and flat plates. At that point, it is ready to be salted, immersed in a solution of water and salt, for a period ranging from 14 to 30 days. After drying in special heating rooms, maturing begins for a minimum of 9 months, to over 20 months, in wellinsulated rooms, with modern control systems that maintain temperature, humidity and ventilation. During the long ageing period, Grana Padano cheese undergoes a series of physical-chemical and microbiological processes that are reflected in its organoleptic characteristics. During this period, the wheels are kept clean, and turned approximately every 15 days. These operations were once done manually, but are now handled by brushing machines and robotic turners. On the ninth month of ageing, all Grana Padano wheels are examined with the traditional inspection tools - a hammer, a needle, and a probe. If the wheels pass all the tests, they will be fire-branded, which guarantees the "safe, fair and merchantable quality" required for Grana Padano PDO. The fire-branding of the wheels is performed by each dairy's own staff, under the watchful eyes of Consortium officials, and under the control of the official certifier (CSQA). The reproduction of the brand mark, the distinctive yellow logo, must feature on all packages of grated and portioned cheese, thus guaranteeing the consumer that the product in hand can legitimately be called 'Grana Padano' PDO. Without this branding, the cheese cannot be named or marketed as Grana Padano PDO. The wheels that bear the marks of "Grana Padano" origin, but which on final inspection do not meet the necessary standards, are subject to the cancellation of the trademarks by "screening"—obliterating the rhomboid and four-leaf clover symbols that identify as Grana Padano a cheese that does not meet the right standards. Everyone knows about the nutritional importance of milk in human nutrition. But not everyone knows that Grana Padano is a concentration of milk nutrients. In fact it takes 15 litres of milk from the territory of the PDO, mostly in the Po Valley, to produce a kilo of this precious cheese. Most of the macro-and micronutrients in milk, excluding lactose and whey proteins, are present in Grana Padano, which can be eaten as part of a lactose-intolerant diet. 100 g of Grana Padano PDO contains, on average, 33 g of protein, which makes Grana Padano cheese naturally high in protein. Grana Padano proteins are milk proteins, giving them a high biological value because they contain the eight essential amino acids, of which 18% are branched-chains, so-defined because our body cannot produce them and must take them from food. Proteins are essential for all stages of life; not only are they fundamental for the normal growth and development of bone in children, but also for the growth and maintenance of muscle mass for all ages. The milk to make Grana Padano PDO is semi-skimmed by natural surface skimming during processing and then the fat is reduced to an average of 28 to 100 g of cheese. Of these, saturated fats are approximately 68% and 32% are unsaturated, including 28% monounsaturated and polyunsaturated fats which, together with the 4% to 11% of saturated short-chain fatty acids are also known as "good fats." Grana Padano PDO, as a concentrated form of milk, is also a concentration of minerals. It is rich in zinc, calcium, copper and phosphorus. It is also a natural source of selenium, iodine, and magnesium. According to the INRAN (Italian National Institute of Research on Food and Nutrition) tables of food composition, 100 g of Grana Padano PDO contains 1165 mg of calcium, which is important for development of bone in children, as well as for the maintenance of normal muscle function, teeth and bones in all segments of the population. The high zinc and copper content, and the presence of selenium contribute to the protection of cells from oxidative stress, while the phosphorus and magnesium contribute to the maintenance of normal teeth and the iodine contributes to normal thyroid. The vitamins contained in milk, and concentrated in Grana Padano PDO, are very important for a balanced diet. Vitamin A and group B vitamins are found in the highest quantities. In particular, Grana Padano contains vitamin A and vitamin B2, which contributes to the normal function of the immune system, and is rich in vitamin B12, which contributes to normal nervous system, and to the reduction of tiredness and fatigue. For a balanced diet, it is necessary to take into account the relationship between calories and nutrition, avoiding sources of 'empty' calories, such as alcohol. A 50g portion of Grana Padano PDO, eaten instead of, for example, a portion of meat or 2 eggs, provides 196 calories, but also contains a number of important nutrients that are not easily found in other foods with the same calories. For all these reasons, Grana Padano PDO is considered an excellent food to include in a varied, correct and balanced daily diet. Aged between 9 and 16 months, Grana Padano PDO is softer and less grainy than the more mature versions. Pale yellow in colour, its taste is mild, milky and delicate. At this age, Grana Padano is a versatile “young” cheese perfect as a topping for meats and vegetables, for sauces and gratins, and is ideal as an appetiser or used as shavings on a fresh salad or beef carpaccio. The lightness of this cheese makes it perfect with young white and sparkling wines. With a soft straw-yellow colour, Grana Padano “over 16 months” has a grainier consistency and crumbles when cut. The sweetness in its flavour is less noticeable and it has a stronger, though never overpowering, tangy taste that make this vintage ideal for grating or simply as part of a cheese-board. Great for hot dishes like quiches, soufflés and vegetable pies. Ideal for pasta sauces, risottos and soups. It pairs very well with young, fresh red wines of moderate intensity and body. Aged for at least 20 months, Grana Padano Riserva is distinctly grainy in texture, and has a consistent deep straw-yellow in colour. When aged for 24 months or more, it acquires a richer, fuller flavour, but without becoming too aggressive. Besides being a special ingredient in a great variety of dishes, Grana Padano RISERVA also works extremely well when served as part of a luxurious cheese-board with nuts, fruits and chutneys. A choice for gourmets and connoisseurs! Due to its distinct flavour, Grana Padano RISERVA should be enjoyed with a soft red, intense, tannic wine which has a moderate to high alcohol content and a lingering and persistent flavour but also with a full-body and rich red wine. It also makes a great end to a meal, when paired with sweet dessert wines (like "passito") to balance the strong yet never overpowering taste of the cheese. - The Consortium is not a producer and therefore cannot be considered an industry. - It does not promote one particular make/brand but a national a PDO product (EU Regulation 1151/2012). 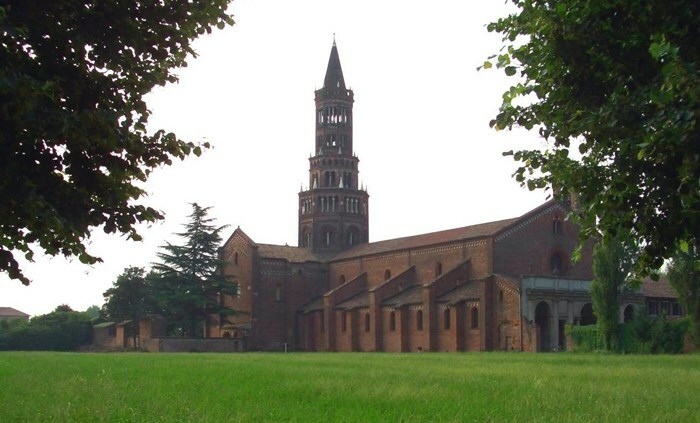 A thousand-year history combines the Abbey of Chiaravalle and the Grana Padano DOP.